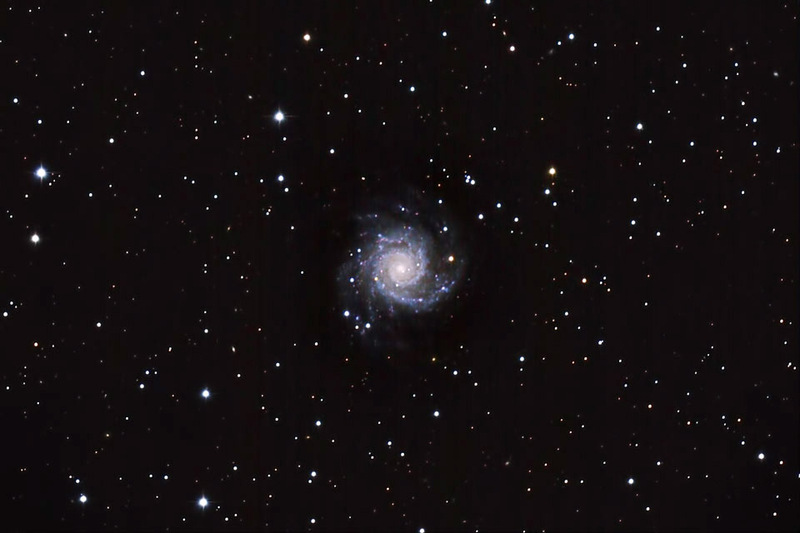 M74 is an excellent example of a face-on "grand design" spiral galaxy. It has many star-forming regions. It lies approximately 32 million light years away in the constellation of Pisces. It is slightly smaller than our Milky Way. Images were focused using Live View. They were aligned and combined in ImagesPlus. Adjustments were made in Photoshop (Curves, Levels, Cropping). Noise was reduced using Topaz DeNoise. My backyard observatory in southeastern Minnesota on 11/6/10. Temp was 40 deg. F. Humidity was 50%.